Pizza, pizza, pizza… the transition to vegan is one that will have you craving the conveniences and flavors of this worldwide favorite. Before our transition to plant-based lifestyle we would order out pizza at least twice a month. It was quick, easy, minimal clean-up and left our bellies FULL. We still love pizza. But finding really great plant-based pizza can be hard and expensive. When these cravings would hit, I started making pizza at home. Now, making pizza from scratch at home takes a little more planning then grabbing your phone and ordering but it can be so satisfying and way more delicious. All you need is some good dough a hot oven and your favorite toppings. 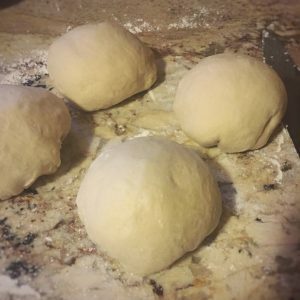 Here is our favorite pizza dough recipe. In a large mixing bowl combine the warm (not hot) water and active yeast together. Let sit for 5 minutes, until it begins to foam. Add in the sugars, salt and olive oil a gently stir. Begin combining the flour to the wet mixture in ½ cup increments either in a stand mixer using a dough hook or with your hands until a dough begins to form. Continue kneading in stand mixer or with hands for 10 minutes until the dough forms a smooth, elastic ball. Using olive oil on your hands, grease the inside of a large, clean bowl and place the dough in the middle. Cover with a warm damp dish towel and place in a warm area for 30-45 minutes or until dough has doubled in size. Once the dough has doubled in size, remove from the bowl onto a clean, floured hard surface. Knead the dough a few times and then cut the dough into 4 portions. Each portion should make a rectangle pizza that covers a standard baking sheet. * Pizza’s should be baked on either a stone or baking sheet. Semolina Flour can be spread on the pan before laying out the dough to prevent sticking or you can use parchment paper. Do not use wax paper!